Daniel McCarthy, editor of The American Conservative, has started a bit of a controversy with his essay "Why Liberalism Means Empire," the thesis of which is that the "happy accident" of the liberal state was made possible only by the existence and beneficence of the British empire. Liberalism, says McCarthy, is dependent on the protective embrace of a global hegemon: this is the "bitter truth" libertarians and anti-interventionist conservatives must face. "What in fact has triumphed over the last 250 years – not since the Battle of Jena in 1806 but since the end of the Seven Years’ War in 1763 – is not an idea but an institution: empire. Successive British and American empires created and upheld the world order in which liberalism could flourish. Fukuyama’s ‘liberal democracy’ turns out to be a synonym for "the attitudes and institutions of a world in which Anglo-American power is dominant." Counterposed to Fukuyama’s Germano-centric Hegelian vision of a "world homogenous state" evolving out of the "spirit of History," we have McCarthy’s Anglophilic version of reverse Fukyama-ism, in which liberty is a "happy accident," a rare and fragile flower that can only be sustained within the hegemon’s hothouse. Two seemingly polar opposite views, and yet when one strips away the neoconservative view that dresses itself up in Hegelian "dialectical" drag, their differences – in terms of practical policy – turn out to be a matter of degree rather than a matter of principle. McCarthy’s essential premise is that history refutes the anti-interventionist arguments of "idealists" who deny the fundamental beneficence of empire, whether British or American. And McCarthy writes about the motherland and the colonies as if they were essentially the same entity, as in the so-called Anglosphere – although he doesn’t use that exact phrase. In McCarthy’s version of history, the British somehow "lost" their North American colonies but this was just a passing consequence of their world-historical triumph at the conclusion of the Seven Years War. The American Revolution is mentioned only in passing. Britain, not America, is seen as the vessel of liberty – a rather odd perspective for an American conservative to have. "[T]he end that the English imperialists sought to attain in the creation of a customs union embracing the dominions and the mother country was the same as that which the colonial acquisitions of Germany, Italy, France, Belgium, and other European countries were intended to serve, viz., the creation of protected export markets." The British East India Company is the textbook example of mercantilism, the great enemy of free trade: a similar mercantilist impulse generated the late nineteenth century American crusade to "civilize" the unfortunate peoples of Cuba, Puerto Rico, Hawaii, and the Philippines, an episode McCarthy mentions only in passing. McCarthy cites Mises in conditional support of delaying the decolonization process, but he elides the passages where Mises condemns imperialism – not excluding the British variety – as an oppressive system of unmitigated brutality. McCarthy also fails to note the historical context in which Mises wrote: Liberalism was published in 1929, before the colonial peoples threw off their shackles and achieved independence. The continuation of relatively unobstructed international trade was considered essential enough by Mises to delay but not obstruct a decolonization he rightly thought was inevitable as well as just. Those conditions no longer apply given that trade will continue in, say, the Middle East absent American hegemony in the region – after all, they have to sell their oil to someone, don’t they? McCarthy ignores those passages from the works of Mises which contradict his thesis that British imperialism gave birth to and nurtured liberal democracy – and also practically elides the American Revolution itself, which was, after all, a struggle against British imperialism. He also gives us an Anglophile’s "history" of Anglo-American relations, which doesn’t quite comport with reality. I seem to recall a little episode where – not far from the offices of The American Conservative – British troops burned the White House to the ground, in a war in which a good proportion of New Englanders aligned with the Brits against their own government. The Americans came up against their British cousins once again in Central and South America, where the two countries almost went to war over a boundary dispute between British Guiana and Venezuela. McCarthy praises the "Monroe Doctrine" as a signpost of "peace," but President Monroe’s unilateral declaration was a précis to American designs on Cuba and the Caribbean and an invitation to the British to "bud out." "Liberalism and empire reinforced one another in manifold ways. Britain met military necessities of the Napoleonic wars with moves toward domestic liberalization – more civil rights for Catholics and Dissenting Protestants, who could hardly be asked to serve under arms while being required to swear religious oaths and denied the chance to participate in politics. The manpower needed to police the seas even after Napoleon’s defeat provided further incentives for reform, as did the growing wealth brought about by the trade that empire and peace made possible. "As British industrial magnates became wealthier, they demanded a greater role in politics; as their employees became more numerous, they too demanded representation and rights. The franchise expanded, religious liberty was extended, and liberal democracy as we know it steadily evolved within the context of empire." "In England, the classical liberals began their shift from radicalism to quasi-conservatism in the early nineteenth century; a touchstone of this shift was the general British liberal attitude toward the national liberation struggle in Ireland. This struggle was twofold: against British political imperialism, and against feudal landlordism which had been imposed by that imperialism. By their Tory blindness toward the Irish drive for national independence, and especially for peasant property against feudal oppression, the British liberals (including [Herbert] Spencer) symbolized their effective abandonment of genuine Liberalism, which had been virtually born in a struggle against the feudal land system. Only in the United States, the great home of radical liberalism (where feudalism had never been able to take root outside the South), did natural rights and higher law theory, and consequent radical liberal movements, continue in prominence until the mid-nineteenth century." Undermined by utilitarianism, which denied the natural rights basis of individual liberty, and by evolutionism – an early version of Fukuyama’s "end of history" thesis, which relegated liberals to defenders of the status quo – liberalism went into decline at precisely the moment when the British empire reached the apex of its power. The reality is quite the reverse of McCarthy’s thesis: imperialism is the great destroyer of liberty, not its defender. We see this today as our leaders invoke "national security" to justify the Surveillance State, and point to our endless wars to rationalize the War Party’s endless assault on the Constitution. As Robert Higgs has demonstrated in his books, starting with Crisis and Leviathan, every episode of warfare in America’s history has been the occasion for a "great leap forward" in government power: "emergency" regulations put in place during a ginned up "war crisis" inevitably persist – and metastasize – long after the alleged crisis has passed. McCarthy’s explanation for the decline of the British empire is no more convincing or accurate than his account of what happened to nineteenth century liberalism. He says Britain "did not have the wherewithal to contain Germany," but what does this "wherewithal" consist of? The simple fact of the matter is that empires cost money. Overextended and steadily losing economic ground to the freer and more productive United States, as well as other emerging powers, the British empire was beset on every side by rebellious peoples abroad and discontent at home, where the price of empire was being paid in onerous taxation and increased regulations. What we are seeing in Britain today – an economic basket case drained by socialist policies to the point of near exhaustion – is the end of a very long road, the beginning of which was what Rothbard rightly dubbed the "inner rot" of British liberalism. McCarthy bypasses World War I in a paragraph or two, thinly rationalizing Britain’s anti-German alliances and never mentioning how the US came to be involved. The extensive British propaganda effort to drag us into the conflict is passed over in silence, as well, along with the economic interests in America that favored US intervention. This allows him to jump right over into World War II as the war America supposedly had no choice but to fight. Essentially, McCarthy makes the argument that we hear from neocons and warmongers of every variety: surely you non-interventionists wouldn’t have let Hitler conquer the world! "Their argument doesn’t hold up. Although the two great anti-liberal powers, Soviet Russia and Nazi Germany, eventually turned on one another, a scenario in which they completely canceled one another out is implausible, to say the least. More likely one would have overcome the other, and the alacrity with which Soviet power did in fact fill the vacuum left by the defeated Nazis in Eastern Europe after World War II suggests what would have happened to all of Europe had one totalitarian juggernaut triumphed." McCarthy’s vision of a world overrun by either the Nazis or the Communists is unrealistic. The Nazi regime was inherently unstable due to the lack of any principles of succession. Who would succeed Hitler as Fuehrer upon his death? The Nazi system was not set up to answer such a question, and it’s not hard to imagine what would’ve happened after Hitler’s demise. The Nazi empire was already rife with divisions and internal rivalries during his lifetime: without him as the unifying authority and mediator, the various factions would’ve torn each other apart in a vicious civil war. And that is entirely aside from the effects of Nazi "economics," whose advocates imagined that a society based on slave labor could long endure in the twentieth century. This is what brought down the Soviet empire in the blink of an historical eye: the economic impossibility of socialism, which only the libertarians saw and predicted long before the Berlin Wall fell. There was never any need to fear the Soviets, whose ramshackle empire was doomed to fail from the start – and the same can be said of the Nazis, whose particular form of brutalism would’ve ensured their demise even earlier. McCarthy writes about "the vacuum left by the defeated Nazis in Eastern Europe" and the alacrity with which the Soviets filled it, and yet it’s rather strange for a conservative of McCarthy’s sort to forget all about Yalta, where FDR handed the captive nations of Eastern Europe to "Uncle Joe" Stalin without a shot being fired. Of course, engaging in the speculation of constructing "alternative" histories is a risky business, but it is reasonable to assume there would’ve been no "cold war" if we had stayed out of both world wars – or even if we had just stayed out of the second one. "Liberal anti-imperialists today, whether libertarian or progressive, make the same mistakes Britain’s pacifists and America’s interwar noninterventionists once did: they imagine that the overall ideological complexion of the world, as determined by the state most capable of projecting power, need not affect their values and habits at home. They believe that liberalism is possible without empire. "There is little historical evidence for this. When libertarians point to how economically liberal city-states like Hong Kong or Singapore are, they ignore the imperial strategic contexts in which those city-states are historically set. No city-state can resist the military force of a superpower; thus, the liberalism of a city-state tends to be entirely contingent on the liberalizing security conditions established by some great empire." McCarthy is always so quick to point to foreign examples that seem to confirm his thesis: Britain, Singapore, Hong Kong, etc. Yet the example that libertarians and other principled opponents of empire look to is the United States before it acquired overseas ambitions, i.e. the US of the pre-Teddy Roosevelt era, when government was relatively minimal and we abjured the competition for colonies that obsessed the European powers and led to constant wars. It was the era in which American politicians, including our Presidents, heeded the Founders’ advice, avoided entangling alliances, and resisted the imperial temptation that had led to the downfall of republics since the days of the ancient Greeks. Imperialism is the blood brother of statism, in economics and in politics: that’s one reason why we libertarians – and all freedom-loving people everywhere – oppose it. An empire must always be defended against those it oppresses, and this requires a "national security" bureaucracy that is constantly thinking up ways to expand its mission. From "defense" of the empire and its supposedly legitimate "interests" our policy morphs into "preemptive" warfare – the elimination of potential threats which, our leaders imagine, could possibly transform into real threats at a moment’s notice. Once we fall down this slippery slope, there is no turning back – we just keep sliding further down into the abyss of out-and-out imperialism, i.e. pure power-worship. And although we may ritually invoke "liberalism" and its preservation, in effect our real goal becomes the preservation and expansion of the empire as an end in itself. This is the great paradox of the "power" McCarthy invokes as the only reliable guarantor of liberal democracy in an illiberal world: the very apparatus of empire he imagines is necessary for its maintenance and defense is, in reality, liberty’s greatest enemy. 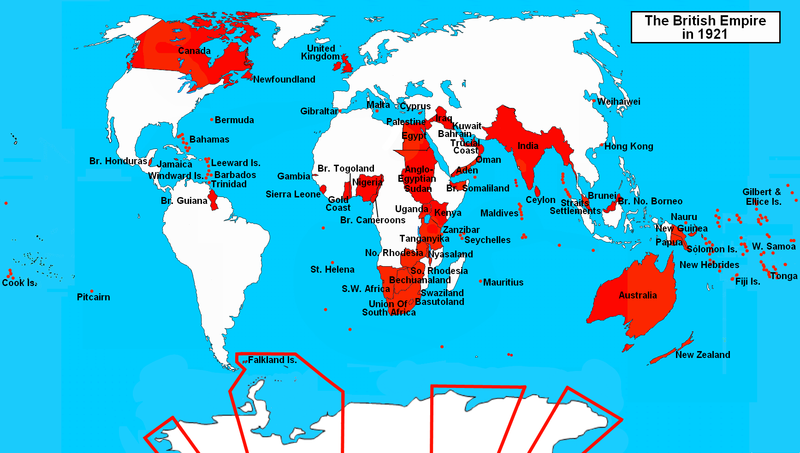 What protected America from the depredations of hostile imperialisms throughout its history wasn’t the British empire but the facts of geography: not the British Foreign Office but the Atlantic and Pacific oceans. As in the case of the American Revolution, America’s unique geographical position gets short shrift in McCarthy’s polemic. What gets even shorter shrift is the British model McCarthy holds up as an exemplar of liberalism. Britain, today, is very far from being a "liberal" democracy: it is, in fact, a social democracy with little regard for civil liberties. British socialism long ago triumphed over Manchester school economic liberalism, and the British version of the Surveillance State has taken on truly Orwellian dimensions: one can easily be arrested in Britain for having a politically incorrect conversation in a pub. "How, now, thou American, frustrated crusader, do you know where you are? "Is it security you want? There is no security at the top of the world. "To thine own self a liberator, to the world an alarming portent, do you know where you are going from here?" McCarthy wants us to face the "bitter truth" that liberty is a rare plant that can only live inside an imperialist solarium, tended by Wise Statesmen who police the world so we can sit around Tweeting, voting for one of two practically identical parties, and watching the latest episode of "Downton Abbey." Yet the truth is much bitterer than that: instead of protecting the liberties of Americans, and people the world over, the United States government is the greatest enemy of liberty on earth – yes, greater than China, greater than Putin’s Russia, and even greater than the Nazi and Stalinist tyrannies. This is true for two reasons: 1) Armed with the tremendous productive power of America’s relatively free economy, which was made possible by our now half-moribund economic liberalism, US imperialism has equally tremendous destructive power, and 2) America is an ostensibly "liberal" power that aggresses in the name of "liberty" and "democracy," and as such represents an internal threat to the very liberalism it supposedly defends. Thus it winds up fatally undermining liberty worldwide instead of defending it, e.g. in its foreign policy, supporting a dictatorship in Egypt, while domestically maintaining a comprehensive system of surveillance of its own citizen – in order to defend "liberty," of course. We must be a world hegemon in order to protect our liberty – yet that role fatally undermines our liberty, and in fact virtually ensures its destruction. What’s a conservative to do in the face of such a brutal paradox? I’m no conservative – being a libertarian, and all – but in the face of such a debilitating contradiction I would do what Ayn Rand advised her readers to do when faced with a contradiction: "Check your premises," she said. "You will find that one of them is wrong." The premise to be checked here is the assumption that America, standing alone, could never have withstood the perils of independence and maintained its liberty without a guardian angel – the British, in this case – to watch over them. Aside from being historically inaccurate, such a view overlooks the simple fact that Britain’s history as an imperial power should serve as a warning to us – as an example of how a nation can choose empire over liberty and slip into an irreversible decline.